Also known as a CEP, PORCINI, BOLETE, borovik, black mushroom, boletus edulis. This mushroom is highly prized for it’s meaty texture and nutty flavor. A must have for mushroom connoisseurs. This is our best seller world wide. The domestic porcini is very mild compared to imported. 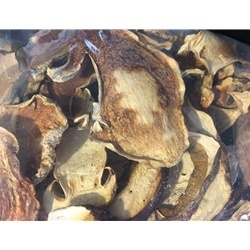 The Oregon/California cep is excellent, it is mild flavored and tasting. Our European Porcini is highly sought after, so we have now added them to our menu. They are dark in color, strong flavored and a very robust scent, the minute you recieve them, the scent will let you know they are there. Everything you look for in a porcini, they are not pretty like our domestic ones, but the flavor is incredible.